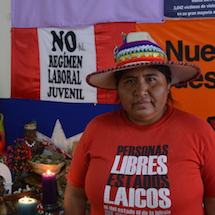 Lourdes Huanca Atencio is president of the National Federation of female peasants, Artisans, Indigenous, Natives and Salaried workers of Peru or FENMUCARINAP. 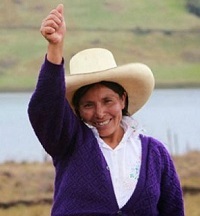 The organization was founded in 2006 with the purpose of defending and fighting for the rights of women in Peru. 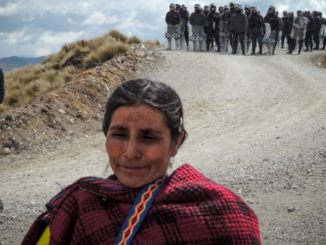 The enormous mining corporation tried every which way they could to evict Máxima Acuña de Chaupe and her family of subsistence farmers. They used the police, guards, journalists, judgements, and many other weapons. But this is a steadfast family, with a woman deeply rooted in her land in Peru’s northern Andes, who resisted with all her strength and would not give up. 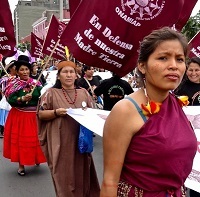 The Tia Maria project, an open-pit mine proposed by Southern Copper Corporation, threatens to poison land farmed by rural communities in the interior of Peru. Currently, the government has lent Southern the force of the national army, the bureaucracy of the courts, and the loudspeaker of corporate media to fight the opposition of local farmers and elected officials. To date, the conflict has claimed eight lives. 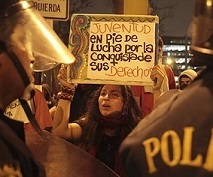 The youth of Peru have started 2015 by showing the country that a break from neoliberalism is possible. 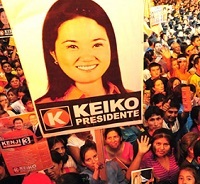 They managed, in the space of just over a month, to mobilize tens of thousands in five separate marches and to force the government to revoke the Youth Labor Regime Law, or, more popularly known as the ‘Pulpín Law,’ a controversial piece of legislation that would have slashed their labor rights. The Yanacocha gold mine did not exist when Reinhard Seifert first moved to Cajamarca, Peru in the 1970s. Everything changed in 1993, when Denver-based Newmont Mining Corp. opened Yanacocha and spurred a modern gold rush of sorts. 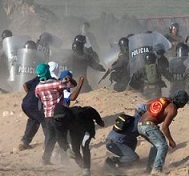 In 2011, the company proposed expanding its operations with a megaproject known as the Conga mine, a project instantly met with relentless, sometimes violent, anti-mining demonstrations. 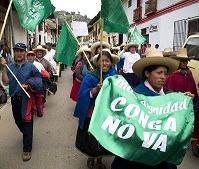 Four years later, the Conga mine expansion remains on hold under environmental review. Throughout this period, Seifert played a pivotal role in the anti-mining movement as former president of the Environmental Defense Front of Cajamarca. 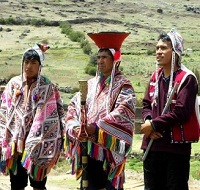 In this town in Peru’s highlands over 3,000 metres above sea level, in the mountains surrounding the Sacred Valley of the Incas, the Quechua Indians who have lived here since time immemorial are worried about threats to their potato crops from alterations in rainfall patterns and temperatures.